(CBS/AP) Google unveiled its long-awaited, ultra-fast Internet service in Kansas City Thursday for an affordable price of $70 per month. The service is intended as a showcase for what's technically possible. Bypassing the local cable and phone companies, Google has spent months and an unknown amount of money pulling its own optical fiber through the two-state Kansas City region. After vetting many contenders, Google announced last year that the Kansas City metro area would be the first in the nation to get its "Fiber for Communities" broadband service. Some cities had used gimmicks to get the company's attention. Topeka informally renamed itself "Google, Kansas." A group in Baltimore launched a website that used Google's mapping service to plot the location of more than 1,000 residents and give their reasons for wanting the service. Hundreds of groups on Facebook implored Google to come to their cities. The $70 per month will pay for "gigabit" Internet service, about 100 times faster than a basic cable modem. 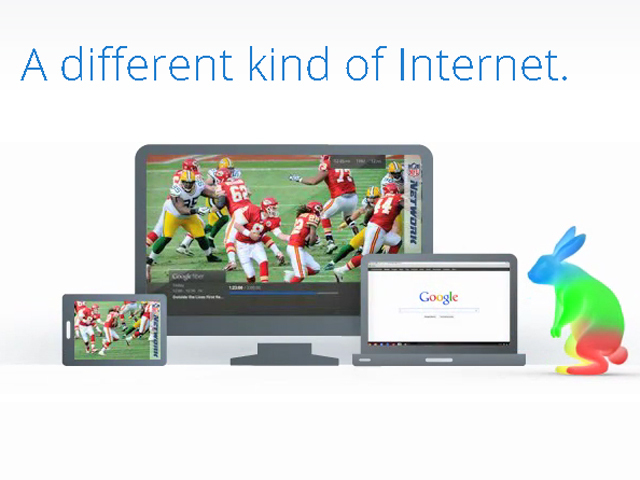 For another $50 per month, Google will provide cable-TV-like service over the fiber, too. Kevin Lo, general manager of Google Access, said in a blog post that Google will also offer a slower Internet option, at a DSL-like 5 megabits per second, with no monthly fee to households that pay a $300 installation fee. The $70 fee is more than cable or phone companies charge for basic Internet service, but the service is also much faster. "Gigabit" speeds, or 1,000 megabits per second, are generally unavailable from other companies. One exception is the city-owned electric utility in Chattanooga, Tenn., which has pulled its own fiber and sells gigabit service for $350 per month. There are few ways for consumers to take advantage of gigabit speeds. For everyday activities such as Web surfing, email and video-watching, there will likely be no substantial difference. The higher speeds will help with video sharing and online backups. Google said it will only start hooking the fiber to households in neighborhood where a sufficient number of people want service. Kansas City residents have six weeks to pre-register for service, after which Google will decide which areas have sufficient interest.